I think this especially hot summer has affected my brain. I have turned into a fan of short novels. Way Station was just right for a hot day and evening. It was barely past the page count for a novella and while it posed several intriguing ideas it moved right along. Clifford D Simak made his living as a journalist for the Minneapolis Star and Tribune, but he loved science fiction and wrote it on the side. He began publishing stories in the sci fi zines in 1931. After Way Station was serialized in a magazine in 1963, it was published in book form and won for Simak his first Hugo Award in 1964. Enoch Wallace fought in and survived the Civil War, then returned to the family farm in Wisconsin. When the story opens he is still there and is 124 years old. Because shortly after the war he was visited by an alien from space and offered the job of keeper of a way station, an interstellar transfer stop for sapient species traveling the starways. Enoch accepted, his parents having died and left their only child the farm. His house was fitted up by aliens and as long as he stayed inside he did not age. He met all manner of beings who left him gifts and reading material. He came to believe that these alien creatures existed on a higher plane than mankind. Being afraid for the way the world was heading for another war, he developed a purpose to somehow bring Earth into the interstellar community and thus prevent his home planet from destroying mankind. 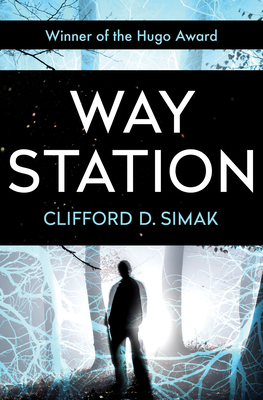 When a US government agent comes snooping around, the Way Station is in danger of being compromised. It is a fabulous tale full of unexpected developments and strange creatures. The mid-20th century trope of aliens keeping watch on mankind, waiting for humans to reach a higher consciousness is in full form here. And why not, with nuclear annihilation being the worst fear in those times. In fact, a friend of mine who is a UFO researcher still believes that! I need to ask him if he ever read Way Station. Pulitzer Prize: no award was given that year due to the prize's advisory board finding not one novel worthy of the prize. I confess I don't recall ever hearing of this book or this author, but it sounds as though you found it to be a worthy read. I had never heard of either myself. It is a wonder what gems I am finding in my reading project. This novella sounds like a fabulous read! It's going on my reading wishlist. Great! I hope you find it as good as I did. Not one novel worthy of the Pulitzer? Seems hard to believe eh? You do amaze me with your sci-fi and fantasy reads. I'm not always as open to different genres. My loss I know. I know, right? Stuffy bunch those Pulitzer guys must have been that year! As far as genres go, I am just a crazy reader who wants to read everything. I like sci-fi because it sort of predicts the future. I like fantasy because they get to use more imagination than is acceptable in realist fiction. But in both genres, not every author pleases me. I am picky. I was into literary sci-fi in my youth. Now, I watch movies of that genre. Still, I find utterly fascinating the ones that break the mold. Did you ever read the Asimov Foundation Trilogy? I thought he broke the mold with those. I didn't. I'll rectify that someday. I think you will like those books. Deep intelligence going on because Asimov was also a trained scientist.